Not only is Siri quite a bit faster in iOS 8, but the virtual assistant is also more intelligent with some new tricks up their sleeve too. One of the notable new features is the ability to recognize what songs are playing, much like the Shazam app that is fairly popular with iPhone users. Siri can either identify music playing from the iPhone or iPad that Siri has been activated upon, or identify music that is playing from elsewhere, as long as it can be picked up by the iOS devices microphone. 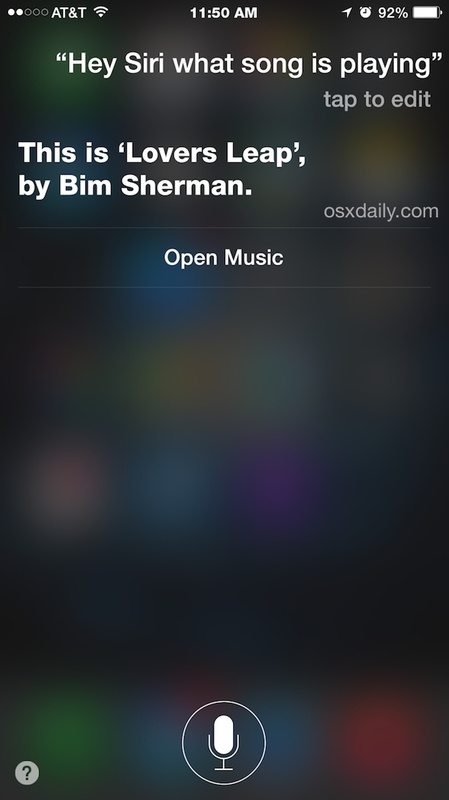 Siri will report back both the song name and artist name. If the song is playing on the device that Siri has been requested from, Siri also provides a link to the app playing the audio stream. This features works best when the music is reasonably clear. Volume level doesn’t matter if it’s being summoned on the device itself, but you’ll want the audio to be at least moderately loud if you’re looking to pick up an ambient song. Try it out with a song playing on the car stereo or in a restaurant, it’s pretty impressive. And once you have the song name, if you feel like singing along just ask for the lyrics and Siri will dish those out too. This is obviously on the lighter side of things, but Siri has a ridiculous amount of capabilities, many of which can help productivity quite a bit. Explore the possibilities and have fun. You can just say shazam to Siri, no need to ask the full question.